All air dryers are designed for a pressure Dew Point of +3º C.
Dryers are Air-cooled except for Model TNE6900W which is water-cooled Water cooling is available on other sizes, on request. Closed circuit refrigeration system with Hermetic refrigeration compressor (Tecumseh or equal), R22/R407C refrigerent with air/ refrigerent heat exchanger (evaporator) and air or water-cooled condenser;capacity control is throughhot-gas bypass valve and condenser fan control. electronically timed type drain valve. Control panel, including power on, fault lamps, start-stop switches, evaporator pressure switch, high discharge pressure safety shutdown switch. Steel baseplate and powder-painted canopy encompassing the dryer components with interconnecting piping & wiring. Standard Equipment Specifications: Twin-tower, heatless dessicant type air dryer, complete with inlet and discharge connections, non-lubricated cycling valves (solenoid or pneumatic operated), inlet and discharge strainers, digital control panel with keypad for the automatic cycling control/display of parameters, pressure gauges on each drying column, non-return valves at the discharge, purge-valves with silencers on each tower. The adsorbent is Activated Alumina. The Pressure vessels are fabricated and certified according to BS 5169, sand-blasted and painted inside and out. The full cycle is 10 minutes, during which the vessels alternate with the drying & regeneration functions. 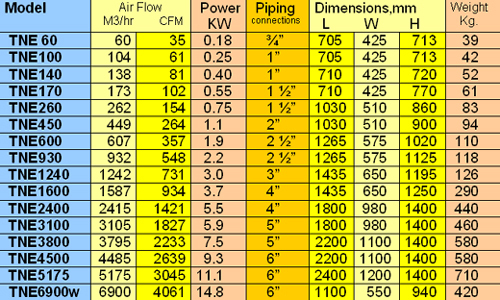 The purge air used is approximately 9 to 14 % of full flow. to do so by monitoring the discharge-air dew point, which saves purge air when the actual air consumption is less than the full capacity of the dryer). air, without using any dry compressed air). 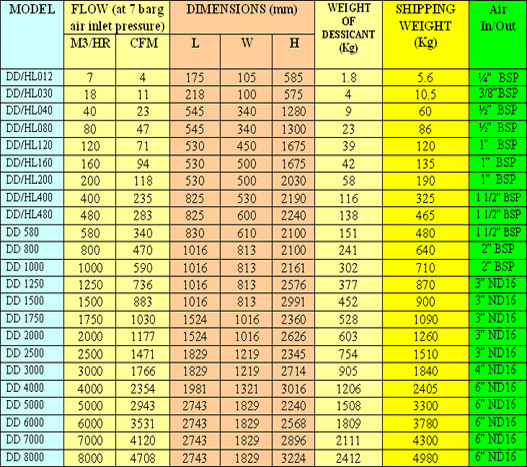 Special instrumentation, including dew point flowmeters, high dew point alarm, visual moisture indicator. 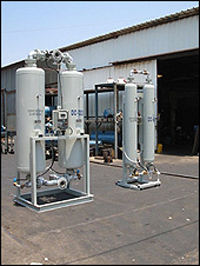 Special executions: dryers for high and low air pressures, factory assembled prefilters and afterfilters, factory assembled bypass piping, Combined cycle - Refrigeration/Dessicant dryer skids, 60 Hz electrics.